It is economic intelligence and law enforcement agency responsible for enforcing economic laws and fighting economic crime in India. It functions under aegis of Department of Revenue, Union Ministry of Finance. to check money laundering by curb black money and hawala trade cases. It is composed of officers from the Indian Revenue Service, Indian Police Service and the Indian Administrative Service. It was established in 1956 as ‘Enforcement Unit’ in Department of Economic Affairs. RAF is a specially trained and equipped wing of Central Reserve Police Force, the country’s largest paramilitary force or Central Armed Police Force (CAPF) with over 3 lakh personnel. It was formed in 1992 to deal to deal with riots, riot like situations, crowd control, rescue and relief operations and related unrest. RAF battalions are based in various parts of the country in order to cut down response time and rush the teams in shortest possible time to counter an incident. The 10 old RAF battalions are based in Ahmedabad, Allahabad, Hyderabad, Mumbai, Aligarh, Delhi, Coimbatore, Jamshedpur, Bhopal and Meerut. Single RAF battalion has strength of just over 1,000 personnel and it is equipped with gadgets and non-lethal weapons like, tear smoke grenade launchers, pump action guns and others to enforce security and law and order in case of protests or riot-like situations. National Security Advisory Board (NSAB). PM-headed NSC is apex body and National Security Advisor (NSA) works as its secretary. The SPG is headed by cabinet secretary and it has chiefs of armed forces, Intelligence Bureau (IB) and RAW as its members. It is responsible for policy-making and for follow up action in matters of national security. The NSAB does long term analysis and provides perspectives on issues of national security. The DAC is Defence Ministry’s highest decision making body for capital acquisition proposals forwarded by the Indian armed forces. It approves the long-term integrated perspective plan for the forces, accords acceptance of necessity (AON) to begin acquisition proposals, and grant’s its approval to all major deals through all their important phases. It also has the power to approve any deviations in an acquisition, and recommends all big capital defence purchases for approval of the Cabinet committee on security (CCS) headed by Prime Minister. SSB is one of India’s Central Armed Police Forces (CAPFs). It is entrusted with guarding the country’s border with Nepal and Bhutan. It was established in 1963 following Sino-Indian War. Its headquarters are in New Delhi and motto is “Service, Security and Brotherhood”. After the Chinese incursion of 1962, it was felt that the borders of the country could not be protected with the force of rifles alone. The government felt the backing and resolute will of a committed border population together with an in-depth understanding and familiarity of the terrain as well as the culture and ethos of the border population was required to defend the borders effectively. As a result, a unique, unconventional yet specialized organization, which would function in the far, flung, vulnerable, strategic, remote, climatically and topographically difficult border areas and motivate the border population across several states towards the cause of protecting India’s national sovereignty was conceived as Special Service Bureau in 1962 and eventually created in March 1963. The SSB was renamed as the Sashastra Seema Bal in January 2001. SSB is part of the para-military force of India. NCRB is nodal agency under Union Home Ministry for authentic source of data on crime on various parameters including accidents, suicides from across all the states of the country and prisons for policy matters and research. It was established in 1986 as the central police organisation. It is implementing and monitoring agency of Crime & Criminal Tracking Network System (CCTNS), a Mission Mode Project under the National e-Governance Plan of Government. It also imparts training in Information Technology (IT) and Finger Print Science for Indian Police Officers as well Foreign Police officers. NCRB publishes 4 annual publications on Crime, Prison Statistics, Accidental Deaths & Suicides and Finger Prints. These publications serve as principal reference points on crime statistics. It has jurisdiction over the territorial waters of India, including its contiguous zone and exclusive economic zone. The Indian Coast Guard was formally established on 18 August 1978 by the Coast Guard Act, 1978 of the Parliament of India as an independent Armed force of India. It is responsible for marine environment protection in maritime zones of India and is coordinating authority for response to oil spills in Indian waters. The ITBP is one of five Central Armed Police Forces of India. It was raised on 24 October 1962, under CRPF Act, in wake of 1962 Sino-Indian War. It was provided full autonomy after Parliament enacted the Indo-Tibetan Border Police Force Act, 1992. It works under command of Union Home Ministry. Its motto is Shaurya – Dridhata – Karm Nishtha (English: Valour – Steadfastness and Commitment). At present, ITBP is strong Central Armed Police Force of 90000 personnel. It primarily guards the 3,488 km long Indo-China border along Tibet Autonomous Region from Karakoram Pass in Ladakh to Jachep La in Arunachal Pradesh. ITBP force is also engaged in a variety of internal security tasks including disaster management, civil Medical Camp, nuclear, biological and chemical disasters and UN peacekeeping missions around the world. Integrated Defence Staff was created in 2001 following the recommendation of GoM which was set up after the Kargil war to review India’s defence management. 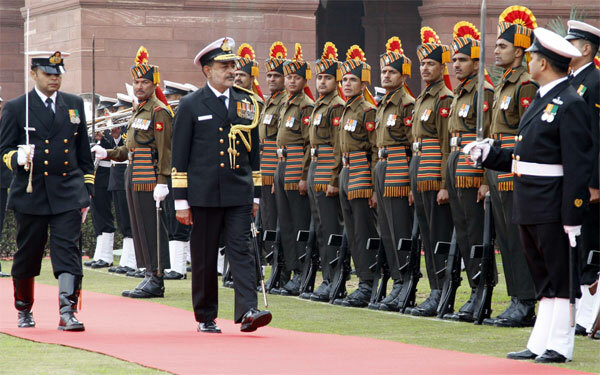 IDS was established to ensure a high degree of synergy between the Armed forces. IDS works towards integration of policies, war fighting and procurement by employing best management practices. The IDS comprises of Service Officers, Civilian Officers and Scientists who perform roles and functions allocated to them based on responsibilities of Integrated Defence Staff. It has representation from all three services, Ministry of External Affairs (MEA), Defence Research and Development Organisation (DRDO) and Department of Defence (DoD) and Def (Finance). The Border Roads Organisation (BRO) develops and maintains road networks in India’s border areas and friendly neighbouring countries. It is staffed by officers and troops drawn from the Indian Army’s Corps of Engineers, Electrical and Mechanical Engineers, Army Service Corps, Military Police and army personnel on extra regimental employment. Officers from the Border Roads Engineering Service and personnel from the General Reserve Engineer Force (GREF) form the parent cadre of the Border Roads Organisation. Currently, the organisation maintains operations in twenty-one states, one UT (Andaman and Nicobar Islands), and neighbouring countries such as Afghanistan, Bhutan, Myanmar, and Sri Lanka. The BRO operates and maintains over 32,885 kilometres of roads and about 12,200 meters of permanent bridges in the country. The Border Roads Organisation works under the Ministry of Defence.